**This is a sponsored post by Topgolf but as always all opinions are my own. I gotta keep my son Anthony busy - he's 8 years young and his energy is through the roof. One of the fun things we like to do but hadn't visited in a while was, Topgolf. So I made it extra fun by inviting his friends and their mom. I love inviting his friend John and his brother, the cutest little Cuban kids. Their mother Maria, speak Spanish to her kids and with Anthony and it helps me when I teach him the language as well because his friend knows how to speak it too. 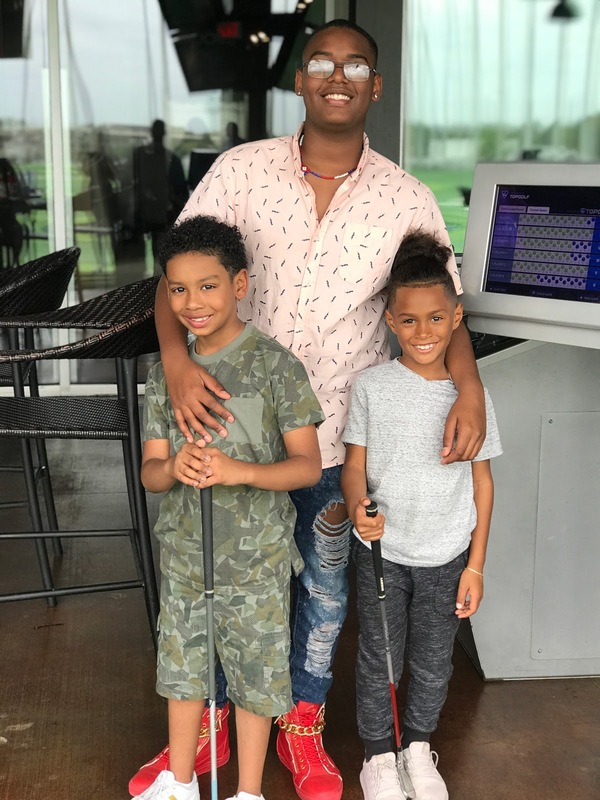 We started off with activating their memberships, which btw if you click here you can get a free membership to Topgolf which will save you the $5 membership fee. Topgolf makes it an easy breezy experience for everyone to have fun. Each golf bay has its own waitress who takes your order and helps you set up the games. The weather was perfect, totally enjoyed sitting outside watching the kids play. We each ordered our own meal. I ordered a cob salad (trying to stay healthy), Anthony ordered the chicken and waffles, his friend ordered a breakfast pizza, a burger and we each ordered a lemonade. The food, was good. The kids loved it! While we were playing, Anthony got a bit discouraged at his swing. He kept trying to hit the ball and couldn't seem to get it. The staff at Topgolf offered a mini lesson and within minutes his confidence boosted and he started hitting the balls. I have it on my schedule to return to the Noches Latinas night at Topgolf where they will have a DJ playing some of our favorite latin hits. Topgolf also has a large bar, pool tables and so many televisions making it easy not to miss a game or anything you may want to watch while at Topgolf. If you haven't been to a Topgolf, I definitely think you should. It's great for the family, date night, and for some good, clean fun. Remember to take advantage of the free membership!